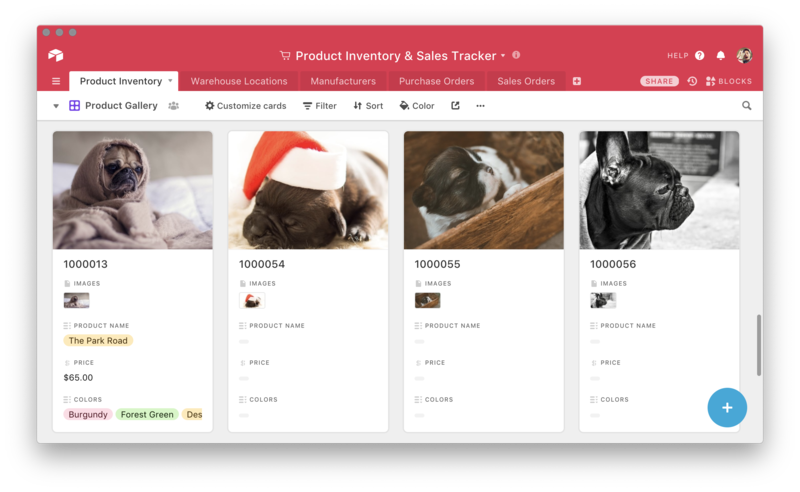 While grid view offers a concise organization of your data, gallery view provides a more visually appealing approach with the help of any images uploaded to an attachment field. If you have many images (or any other type of file) to upload, you can save yourself a lot of time by dragging a batch from a folder (or your desktop) directly into any gallery view. When you do, if you target an existing record you can upload them all to the attachment field at the same time. Alternatively, you can create a new record with all the files or a series of individual records for each file by targeting the new record button (+). Simply drag your selection onto the transformed new record button, release the mouse, and select your preference from the options that appear. 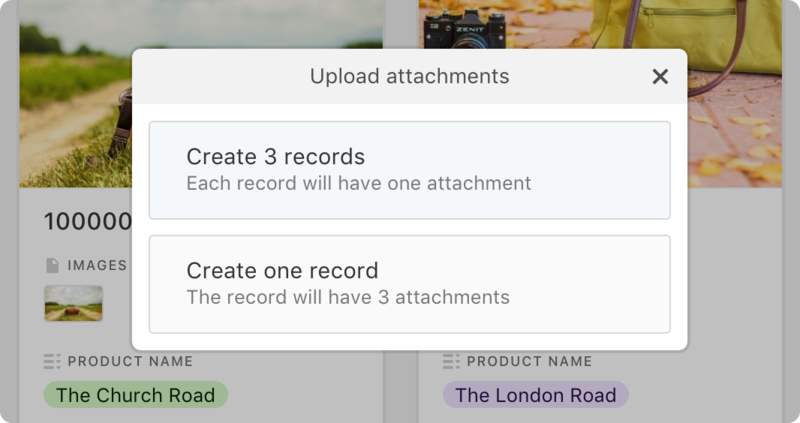 Airtable will automatically name the newly created record(s) based on the uploaded files. 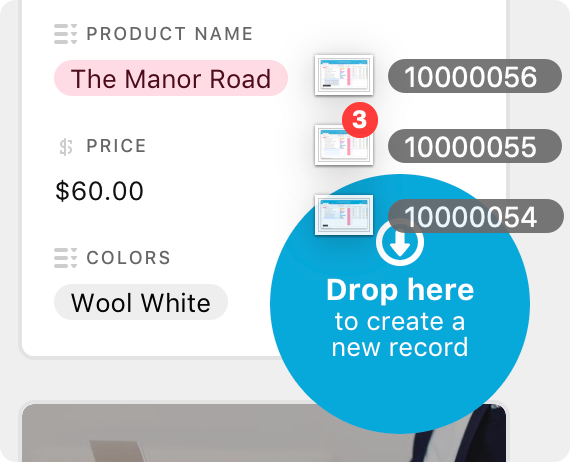 This method of creating records in bulk can save you a lot of time, but you’ll notice it can’t work if you haven’t yet added an attachment field to your table. Furthermore, you will need to click the Customize cards button in the table toolbar to set it as your target destination. 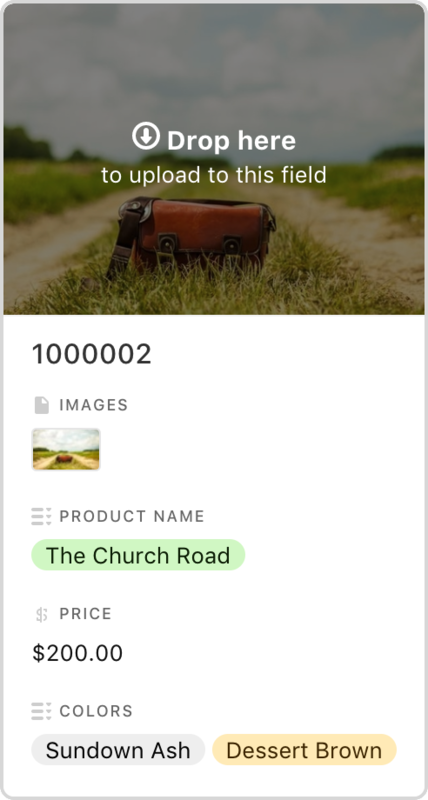 If you create a single attachment field in any other view prior to creating your gallery, Airtable will automatically set it as your cover field so that you can upload batches of images immediately. 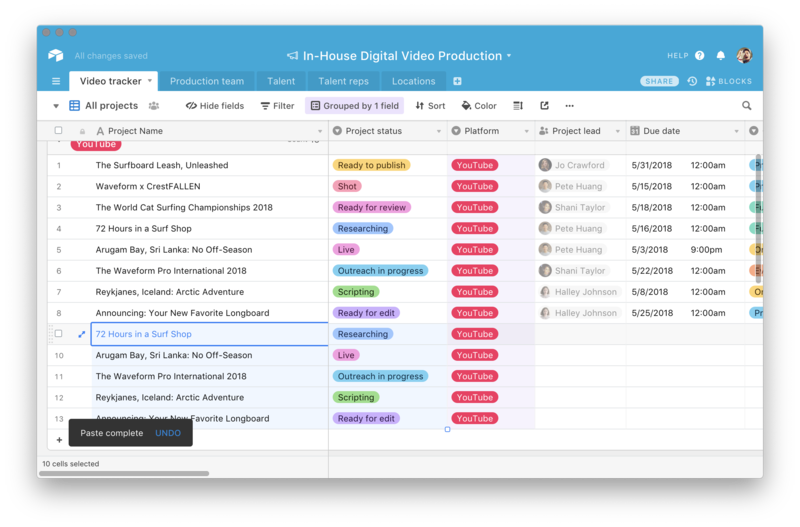 In Airtable, you can copy and paste several cells across many fields and records or just one at a time. Whenever you select one or more cells, press Cmd/Ctrl+C to copy them. To paste once, you only need to select a single cell as a starting point and press Cmd/Ctrl+V to paste. If you want to paste the same information into multiple records, select a starting point, hold down the shift key, and then click on the cell that completes the range you want to fill before pasting. 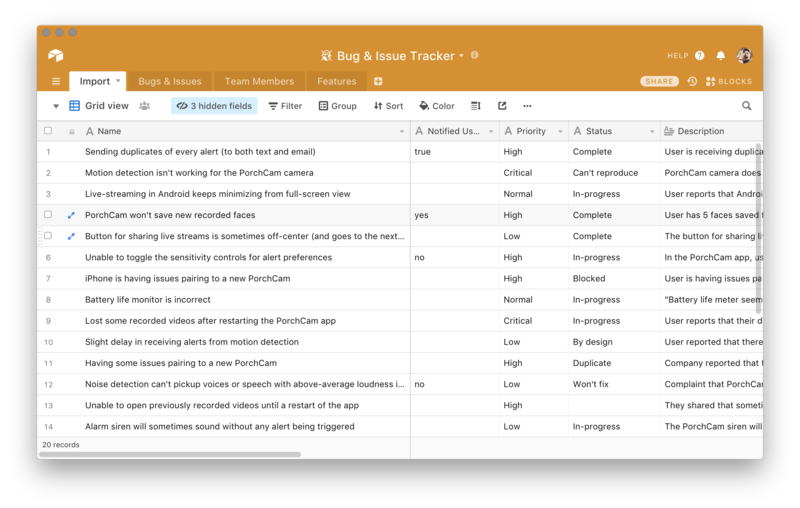 Whenever you paste, Airtable will fill the necessary cells whether they contain information or not. If you make a mistake or end up with an unintended result, you can revert this change using another shortcut: Cmd/Ctrl+Z. Sometimes you’ll want to copy data from one base to another. If your destination base is already set up with the fields you want to fill in, pasting your desired values is easy. First, make sure that the fields in the base you’re copying from are in the same order as the ones in your destination base. Then you can do a simple copy and paste to transfer the values from the first base into the appropriate fields in the second one. If you’re copying from an existing base into a new one (or into a fresh table), there’s no need to spend time recreating the field types before copying values over. 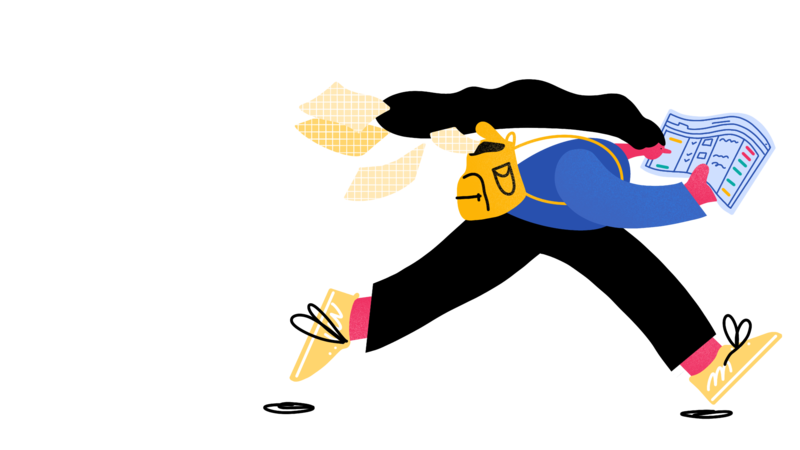 You only need to paste what you copied into an empty table and Airtable will do the work for you in most cases. When pasting linked record fields, however, they will appear, instead, as single line text fields. To reestablish the link, simply convert the single line text field into a linked record field, then choose to create a new table. The existing entries in the field will automatically create corresponding linked records in the new table you’ve just created. To read more about this method, jump to our guide on setting up linked records. 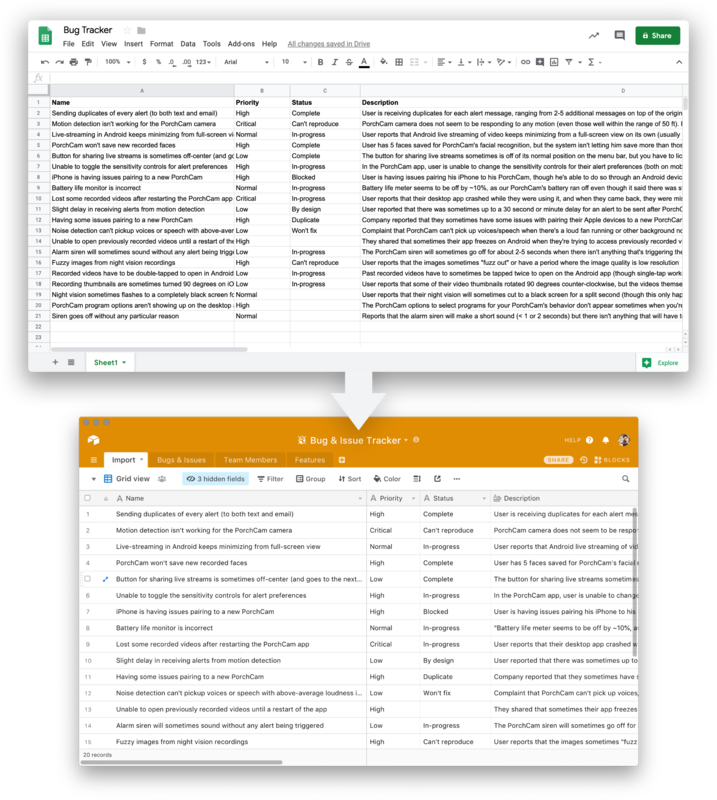 Perhaps you’ve already imported a standard spreadsheet into Airtable using the built-in CSV importer, but in many cases you can save time with copy and paste. 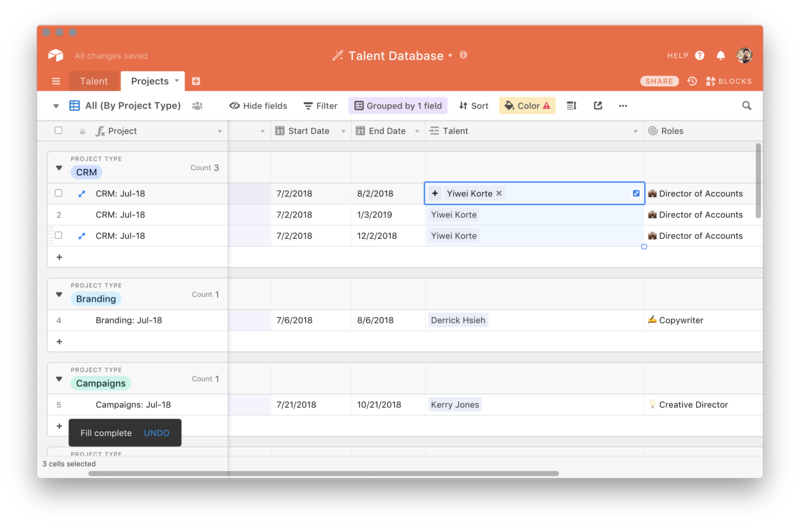 Whether you want to transfer everything or just a selection of your spreadsheet’s contents, copy as many rows and columns as you like and paste them directly into your base to populate it quickly. Note: make sure that the order of the columns in your original spreadsheet match the order of the columns in your Airtable base; otherwise some or all of your data will appear in the wrong fields! …or a new record will be created in the linked table to match the pasted-in text. If you paste a text string containing one or more commas, Airtable will read those commas as a list and create a series of links. To establish a link to a new or existing record with a comma in its name using copy and paste, you will need to surround the text with a pair of double quotation marks (e.g. “Peanuts, Pretzels, Popcorn, and Beer“). For more on this topic, please see the section converting text fields with commas. 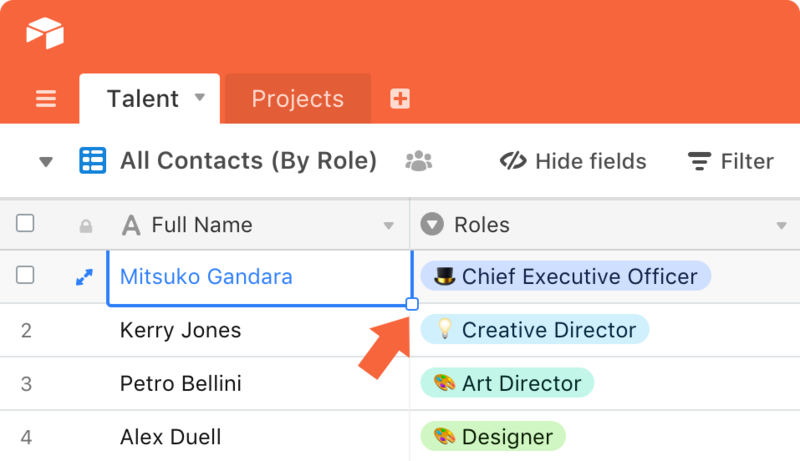 If you prefer using your mouse rather than your keyboard to duplicate information, Airtable provides the fill handle as an alternative shortcut. To use it, simply select the cells you wish to copy, locate the small box in the bottom right-hand corner of your selection, and move the cursor on top of it. When your cursor becomes a cross, click and drag in the direction of the cells you want to fill with the same information and release the mouse to instantly fill them. Both horizontal and vertical directions work in the same way, but please note that you cannot use the fill handle to populate cells that aren’t adjacent to your original selection. Also, when using the fill handle to vertically populate cells, you can drag far beyond the original selection to create a repeating sequence based on that selection—just like you can when copying and pasting with your keyboard. For example, if your selection contains four cells with a numerical sequence (e.g. 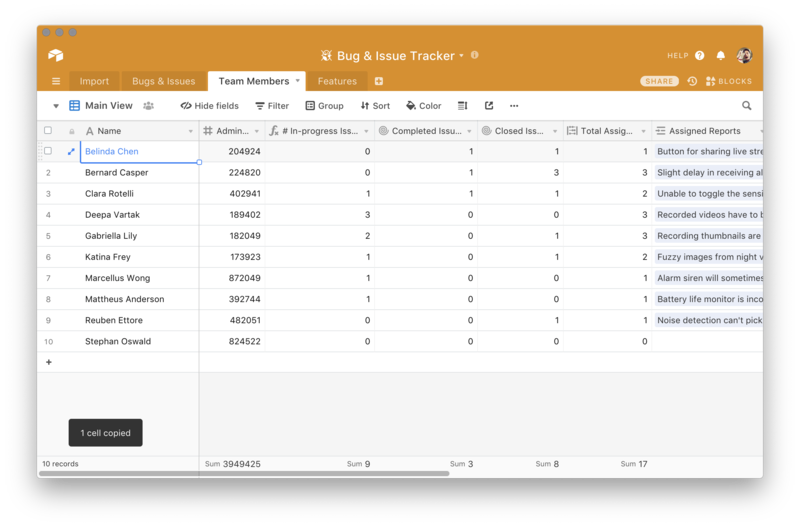 1, 2, 3, 4) and you drag the fill handle vertically across 12 more cells, Airtable will automatically fill those 12 cells with three new copies of that sequence. If you chose 11 cells instead, however, that sequence would repeat in full twice but end before the last number (4) because you didn’t give it enough room to repeat the final number for a third time. This process works similarly for almost every field type, including (but not limited to) text, date, single and multiple select fields, and even linked records. You can use this technique to quickly create recurring field entries, daily or weekly records, tags, and assignments (respectively). 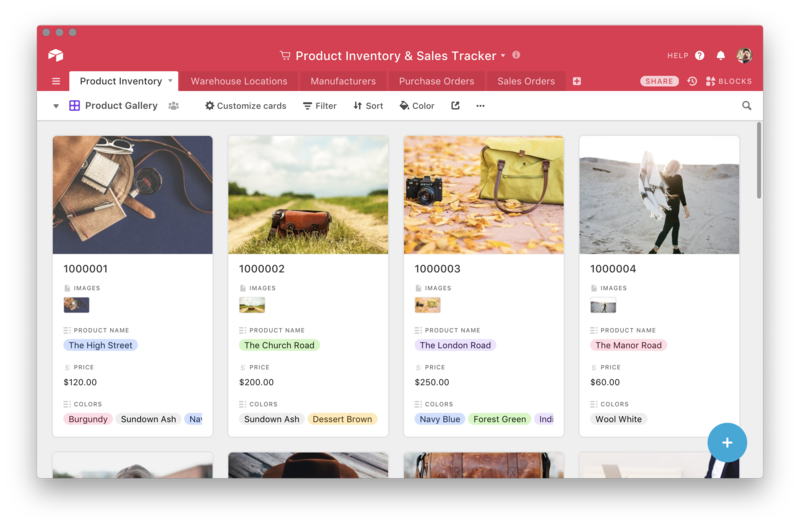 Airtable provides a simple import process that utilizes the CSV format common to all spreadsheet apps. Export any spreadsheet as a CSV and you can import it to create a new base or a new table in an existing base.